This recipe, which uses both the carrot itself and the carrot tops, is from Ivy Manning's story on leafy greens, "Top of the heap." Cut carrot tops away from carrots and set aside. Peel carrots and leave them whole. Bring a large pot of water to a boil. Add 1 tablespoon salt and the whole carrots and boil until the carrots are just tender when pierced with a paring knife, about 10 minutes, depending on size and age of carrots. Drain in a large colander and allow to cool slightly. Meanwhile, roast the cumin seeds in a small, dry sauté pan over medium heat until they are fragrant, about 1 minute. Transfer seeds to a mortar and pestle. Pound the cumin seeds, paprika, and garlic together into a paste. Add the lemon juice, sugar, and oil, and stir to combine. Cut the carrots on the bias into ½-inch slices. Pick the feathery carrot leaves away from their stems and roughly chop; you will need one cup. 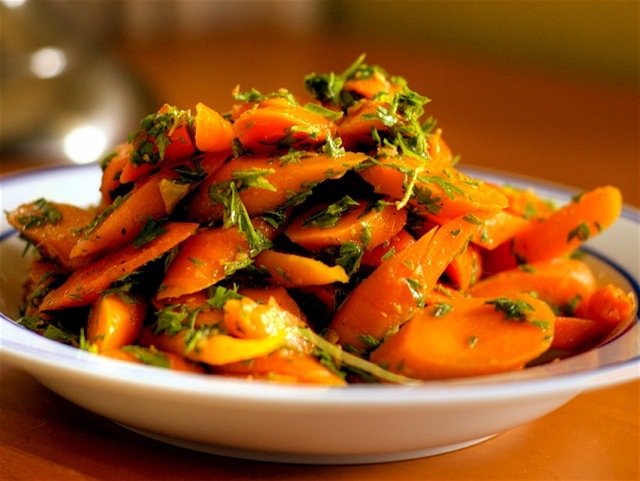 Toss the carrots, dressing, carrot tops, and cilantro together gently in a serving bowl. Season with salt and pepper and serve at room temperature.